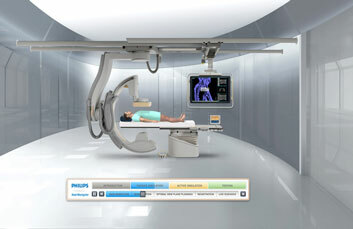 DDA designed an interactive eLearning tool for Philips Healthcare to introduce its new HeartNavigator, a live image guidance device for complex structural heart disease procedures. The tool included a virtual 3D environment with a performer from the DDA Actors' Network to guide the user through both passive and active simulations of procedures using the new device. The passive simulation demonstrates the device's functionality, while the active simulation puts that functionality into the user's hands. By allowing clinicians to test a device in a risk-free environment at their own pace Philips can educate healthcare providers about their latest technologies in a more effective and engaging way than traditional approaches. When engaging in the active simulation the user will get feedback from cues indicating correct and incorrect actions, and if they are in need of more detailed help they can see an example of the task at hand. Once they are confident in their knowledge base they can move into the testing module, answering multiple choice questions on critical information and receiving a personalized, dated certificate once they have attained a passing score. DDA Medical also included closed captioning, log-in and registration pages, and an administrative back-end system for reporting user data.